About once a year, the question of Lenin’s body rises to the surface, but it is unlikely he will be buried. The Lenin Mausoleum, which was built between 1924-1930, and the body that has been preserved in it for nearly nine decades, are the kind of items that would hold a copyright, if one could be applied to such things. In the nearly annual discussion of what to do with the body of Vladimir Lenin, the question of ownership takes on new significance. During the Soviet era, the mausoleum itself was considered a super-guarded national security object and as such it was under the jurisdiction of the security services – the NKVD and KGB. Until the death of Joseph Stalin, the body itself was registered formally in the KGB laboratory, then the laboratory itself was transferred to the Ministry of Health. Today, Lenin's body is "serviced" by the Center of Biomedical Technology Research of the All-Russia Institute of Medicinal and Aromatic Plants Production Association, part of the Russian Academy of Agricultural Sciences. Will Lenin leave his tomb? If the government decides to bury Lenin, it will have to solve thousands of legal issues and cancel thousands of classified departmental orders. For example, in a Nov. 20, 1939 report, People's Commissar of Internal Affairs Lavrenty Beria wrote to Chairman of the Soviet government Vyacheslav Molotov: "To study the conditions for further success of V.I. Lenin's body preservation and to continue scientific and experimental work [...] My Assistant for Personnel, 3rd Rank Commissioner of State Security, comrade Kruglov has been ordered to allocate the existing positions in the NKVD of the USSR to the State Laboratory staff [...] The laboratory shall report its work to the commission appointed by the government [...]The laboratory is administered by the commandant of the Kremlin, according to expenditure estimates released for its operation." Documents on the Lenin's burial and creation of the first wooden mausoleum are still kept unused in the second (secret) inventory of Fund N 16 of the Commission for Perpetuating the Memory of Lenin, hidden in the bowels of the former Central Party Archive of the former Institute of Marxism-Leninism of the former Communist Party Central Committee. And even though the events of which these documents refer are long past, the government still resists making public the reports of Lenin’s funeral and burial. Why? Because the reports may contain the secret formulas of the magic liquid composition that was invented by Professors Boris Zbarsky and Vladimir Vorobyev to preserve the great leader's body forever. On Feb. 23, 1940, Beria wrote to Molotov: “Prof. B.I. Zbarsky, overseeing the preservation of V.I. 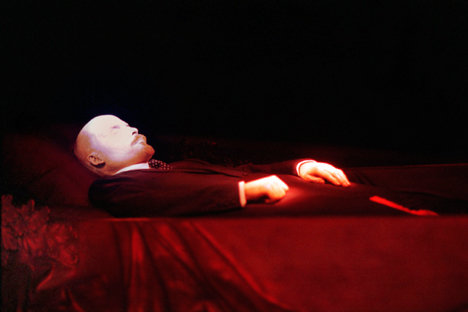 Lenin's body, informed about the need for work to address some of the changes that have taken place in the body (half-open eyes, the decrease in the wings of the nose and the left hand). Simultaneously, the commandant of the Kremlin reported that during a routine inspection of Lenin's body they discovered an opening of the seam on the head and darkening on the nose. To take measures to eliminate the detected changes it is necessary to close the mausoleum of V.I. Lenin from March 1 to April 25, 1940... "
In addition to archival and historical issues there may be an interest in commercializing the formula. It could be sold on the Internet or exported. The demand for the formula is certain: There would be wide application in the funeral and taxidermy industries at the very least. But it is impossible to state for certain if anyone holds a patent or any other kind of rights for the Vorobyev - Zbarsky liquid. Then there is another question. After World War II, the practice of embalming leaders and putting them in mausoleums became a worldwide trend. Soviet expertise in this field was in demand at the highest level. The most successful project in the fraternal socialist countries was the preservation of Stalin’s Bulgarian disciple Georgi Dimitrov. Today, the Bulgarian comrades have been in NATO and the European Union for a long time, and they solved the question of what to do with Dimitrov’s body quickly and expeditiously many years ago – he was buried in the main cemetery in Sofia in 1990; in 1999, his mausoleum was blown up. The first president of the People’s Republic of Angola, Agostinho Neto, was embalmed by the Soviet prescription, but had to be quickly reburied because the magic solution of Professors Vorobyev and Zbarsky turned out to be ineffective in African conditions. Before his death, Stalin became disillusioned with Slavic socialism and turned his attention to Asian socialism. The strength of his attention is felt even today. In China, Vietnam and North Korea, founding fathers have been embalmed and carefully stored in mausoleums open for public veneration and worship. There is no need for an active imagination to know who provided the know-how for all of these mausoleums. And the ongoing Russian debate must prove an annoyance to Russia’s friends from the Asia-Pacific region. In order to keep forever the bodies of Ho Chi Minh, Chairman Mao, the Kim Il-Sung (and everything suggests that the recently deceased Kim Jong Il as well), Vladimir Lenin will need to lay in his mausoleum on Red Square for years to come. The article is abridged and firts published in the Ogoniok magazine.